Although we spend a generous time inside the bathroom every day, cleaning it can become a nasty chore. I know we are grossed out by the things we find as we clean, but cleaning it is a must. You can never justify the word “comfort” in comfort room if its full of bacteria. It’ll also be ironic to think that the place where you clean yourself is actually the place where most bacteria dwell. So now is the perfect time to face your bathroom responsibilities. Here are genius tips that will help you. 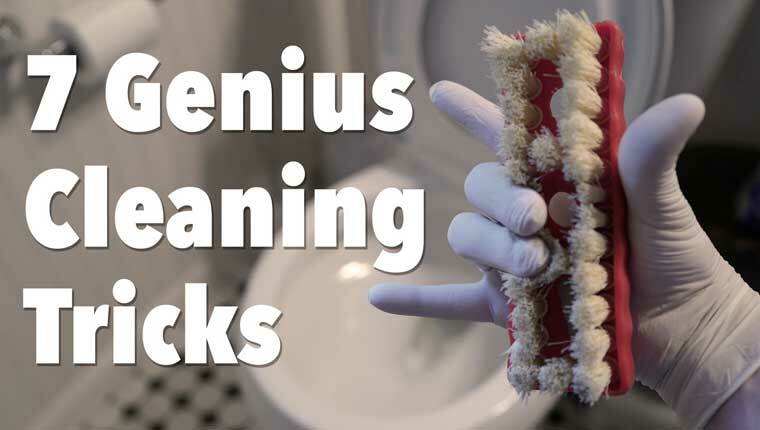 The seven cleaning tricks provided in the video encompasses cleaning the mirror, scrubbing showers, removing stains from fixtures, faucets, soap dispenser and toothbrush holder, and spring-cleaning your toilet and toilet brush. To get started, the clean-up materials you’ll need are distilled white vinegar, black tea, liquid soap, wash cloths, sprayer, old toothbrush, and newspaper. You may not know this but vinegar is an awesome material for cleaning. It comes from nature so no harmful chemicals would hurt you. Well, the smell could stay for a while, but a smell won’t stop you from cleaning, right? Right!